Drop Everything! Long-Awaited Ate Up With Motor Hydra-Matic History Is Out! Those of us who have read and re-read all the back Ate Up With Motor articles have been pacing our garages, waiting for Mr. Severson to finish his promised History Of The First Non-Terrible Automatic Transmission. Guess what? It's done! 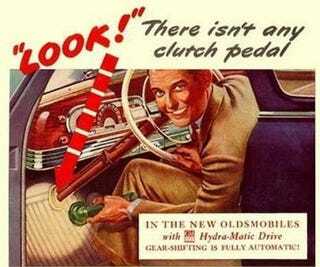 Complete with diagrams, obsessively documented references, and all the other hallmarks of the AUWM piece, It's Systematic, It's Hydra-Matic: The First Automatic Transmission should be considered a must-read.